Much like the N64, the Dreamcast was one of the first consoles to become a good party machine due to its four controller ports as a standard feature. And while their was a great deal of 4-player sport, racing, and FPS games on the Dreamcast, there were not a lot of dedicated party games for the little white console. 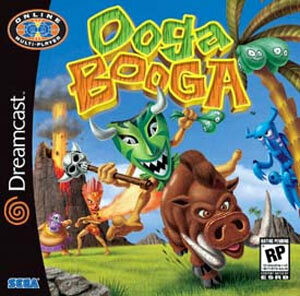 Sega, however, was kind enough to release a quirky game by the name of Ooga Booga as the Dreamcast’s USA retail life came to its end. Because it was released at a time when most people had given up on the Dreamcast and it suffered from a strange name and concept (like many other great Sega games), it didn’t gather much attention. Oooga Booga’s takes some simple gameplay mechanics and combines it with a distinct polynesian style and tone to create a additive tribal battleground that is compelling for veteran gamers, but inviting enough for non-gamers. 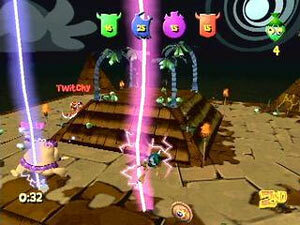 Ooga Booga also featured online multiplayer capabilities that could have been a real hit if there were actually enough people online on a regular basis. If given another chance on a modern console with an established online setup like the Wii or XBox 360, Ooga Booga could be quite a hit. “The gameplay is actually pretty similar, whichever of the 3 game types are chosen. 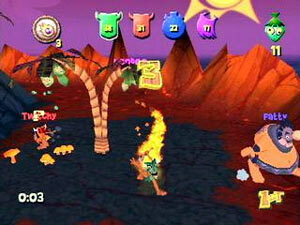 In each case the player guides their Kahuna around the island, attacking the other players’ Kahunas with a number of different mechanisms. The basic attack is a club swing, which adds 2 points to the batters score and sends their opponent tumbling head over heals. The Kahunas also have a simple ranged attack, whereby they can throw a shrunken head at an opponent for a 1 point score. These shrunken heads are available in limited quantities and managing their collection and use is critical when playing against advanced opponents. The third attack form is the use of spells. Spells appear as icons that can be picked up and used by all Kahunas, but cannot be stockpiled in vast quantities. Spell effects are similar to those found in Populous with fireballs, lightning strikes and whirlwinds all making an appearance. The scoring for the spells is well balanced, with spells like lightning, which are nearly impossible to dodge and capable of striking multiple opponents only scoring a single point per hit. The fourth type of attack is through the use of the native wildlife on the island. Such a good game. Really. This was such an awesome game.. never played it multiplayer but played for days on end single player.